Site Selection Magazine has ranked Missouri first in the North West Central Region for the 2013 Governor’s Cup awards, Gov. Jay Nixon recently announced. The rankings found that more than 125 businesses either expanded their facilities or opened new facilities in Missouri during 2013, an increase of 57 expansions over the previous year. In addition to Missouri, the North West Central Region includes Nebraska, Kansas, Iowa, Minnesota, and North and South Dakota. Nebraska was the 2013 runner-up with 109 businesses announcing expansions, followed by Kansas with 106 expansions. “This first place ranking demonstrates that Missouri’s low taxes, trained workforce and excellent quality of life continue to make the Show-Me State a top destination for growing companies,” noted Gov. Nixon. Last year, employment in Missouri grew faster than its neighboring states of Kansas, Tennessee, Oklahoma, Kentucky, Illinois, Nebraska and Arkansas. Missouri has also been the fastest-growing state for technology job growth in the nation for the past two consecutive years. Already in 2014, the state has attracted numerous investments from expanding companies, including 3M in Nevada, GAF Roofing in Moberly, Janesville Acoustics in Warrensburg, Cerner Corporation in Kansas City, LMV Automotive Systems in Liberty, and many more. 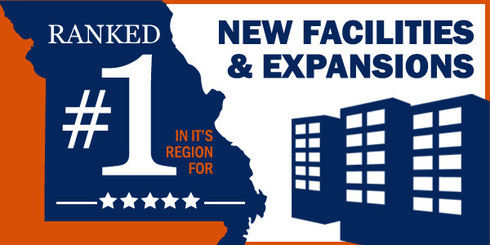 Click here to check out the full list of Missouri expansions to date since 2013. Help us share the news through Facebook and Twitter! Are you a growing business? Check out all of the resources available through the Missouri Department of Economic Development, and help us continue our streak into 2014!